Another world, another time, in the age of wonder. Universal Head interviews Josselin Moreau, product manager at Sans Détour, the company that’s finally bringing Confrontation back to tabletops. 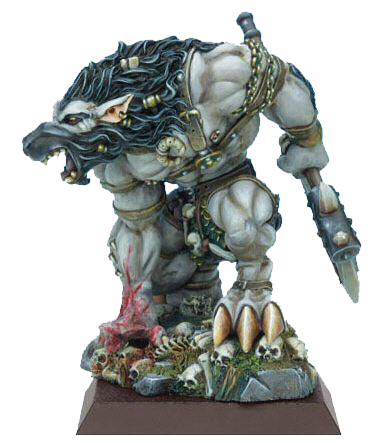 For some years now the EOG has been one of the few gaming websites on the internet still talking about Confrontation, the fantasy tabletop fantasy wargame by Rackham, who sadly went out of business back in 2010. 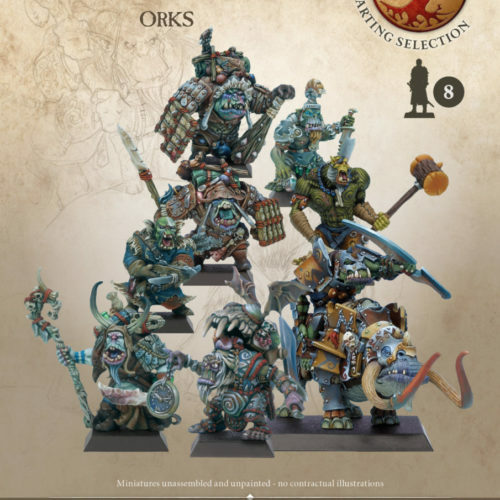 I discovered the game – and bought myself huge armies of both plastic and original metal miniatures – when the 4.0 version of the rules were released (known as Confrontation: The Age of the Rag’narok), but it had been going strong as a skirmish-level game for years with the v3.5 rules, especially in Europe. It’s those rules that are about to be re-released by Sans Détour, along with a huge swag of beautiful miniatures. Universal Head spoke to Product Manager Josselin Moreau about the long-awaited return of Confrontation. UH: Congratulations on achieving what so many have been waiting so long to happen – the return of Confrontation! Full disclosure, but I’ve never played the 3.5 rules of Confrontation, and first discovered the game with the 4.0 Rag’narok rules and the pre-painted minis. Why did you decided to relaunch 3.5 and not 4.0? 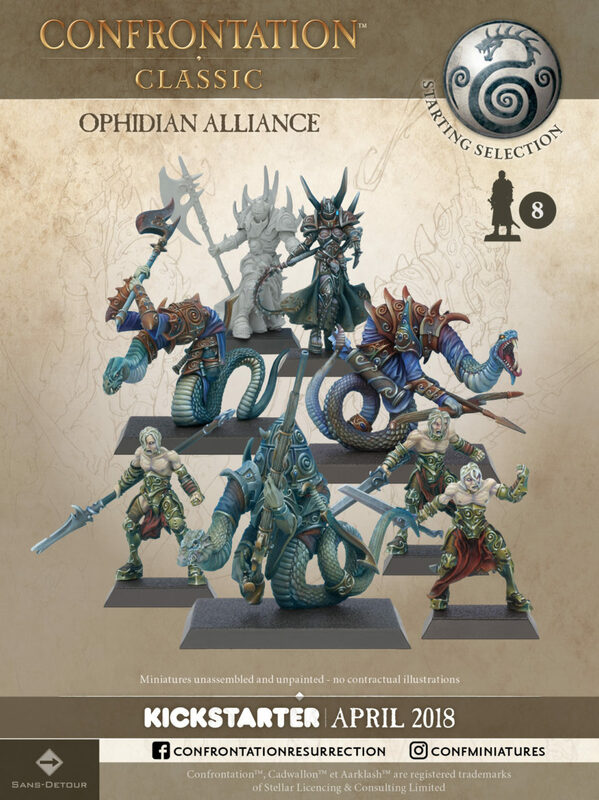 Well, for us Confrontation has always been about being the best skirmish game in miniature gaming. So we want to bring back this feeling of a fast and dynamic skirmish game. 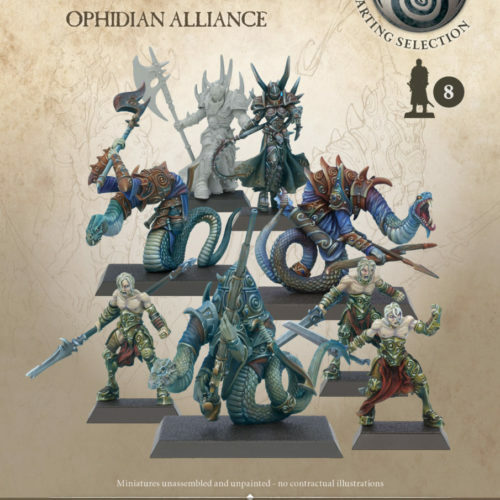 It’s why we chose the latest skirmish rules set, Confrontation 3.5, and why we will develop a new skirmish rules set for Confrontation Resurrection. Confrontation Classic launches on Kickstarter on April 17, 2018. Confrontation Resurrection will launch in 2019. We have many plans for the Confrontation universe (miniatures games, a roleplaying game, board games…) and a mass battle version could be on the table at some point. Right now a skirmish miniatures game is our first step. We’ll see in the future what could be the next steps. UH: Are you making any changes at all to the 3.5 rules with this release? Not really. 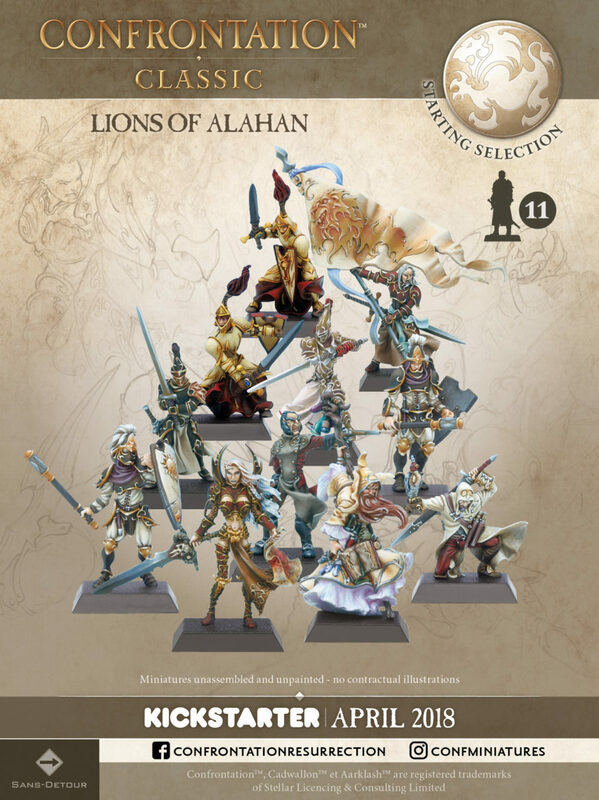 Still, we will provide some brand new profiles designed for the game such as Ashan Delerith and the Unstable Gargoyles (exclusive bonus miniatures you can get by reserving your copy of the new game – see the end of this article for more details) and some others. But basically it’s the same rules. Confrontation Classic will include the best-playtested and most popular Confrontation rules: v3.5. Also included will be rules for experience and a campaign mode (ie, those from the Dogs of War expansion). 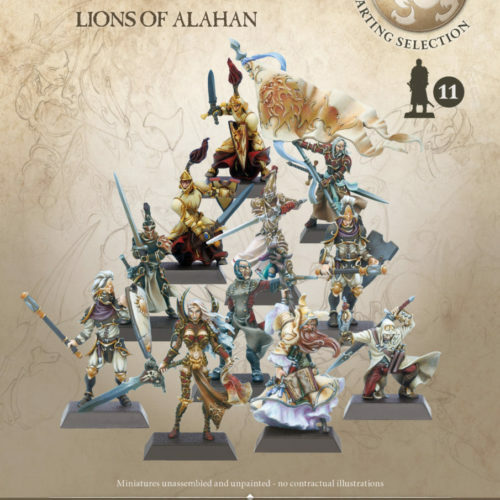 UH: I’m interested in the thinking behind releasing the miniatures with the classic rules, and then later creating a whole new set of rules. Is it just a matter of players having the choice between new rules and old? What can you tell us about the way the two Kicksarter campaigns work together, and the later Confrontation Resurrection set of rules? Confrontation Classic is really about celebration. It’s the 20th anniversary of Confrontation this year and we really want to show off the game and the universe, so people can see what this legendary game is all about. 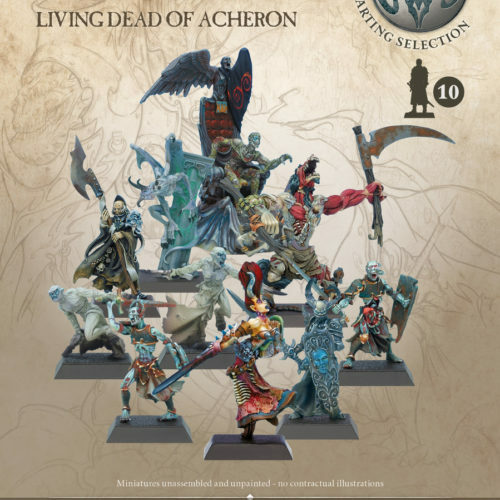 So this Celebration Box is about (re)discovering the game (especially if you just heard about it but never played it), reviving the communities and gathering players together again, and creating a solid base for players (old and new) to jump into Confrontation Resurrection with a wide range of minis. Download the Confrontation Discovery Kit, the perfect introduction to Classic Confrontation. Features information about the world of Aarklash, its history, nations and factions, the game, and the company that’s bringing it all back. 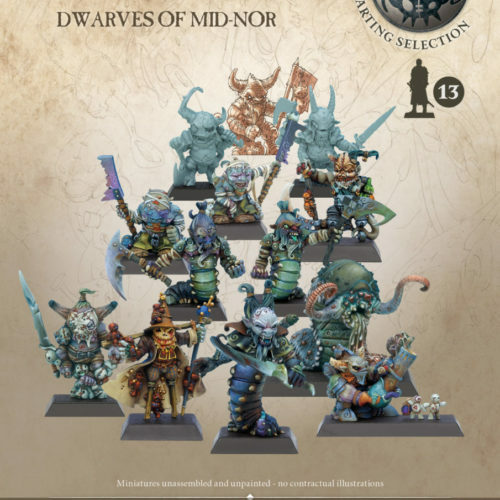 UH: The old miniatures are wonderful, but will you be creating new ones? Will some of the old designers, artists and sculptors be returning to work in Aarklash again? Of course! Confrontation Resurrection will be a new game with new miniatures, and the universe will evolve. And we are in contact with formers artists from Rackham and we hope that many of them will be part of the resurrection of this wonderful universe. 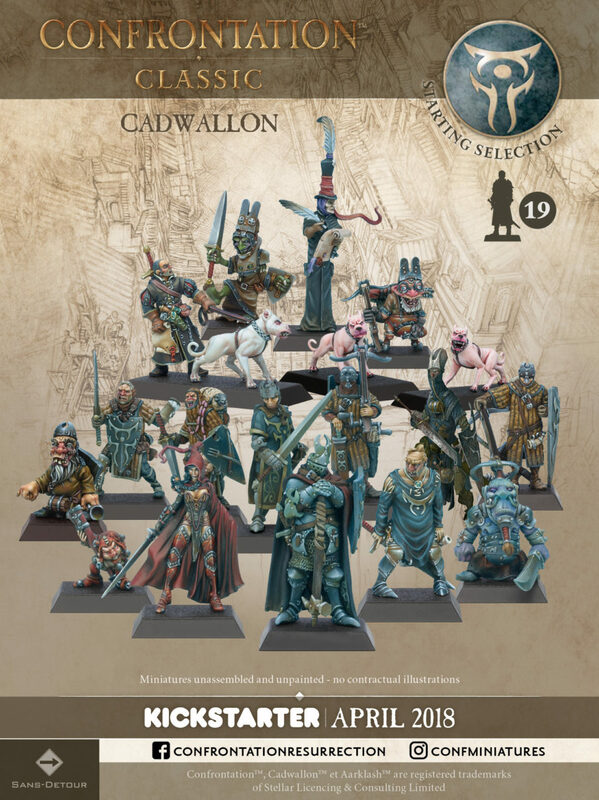 The Confrontation Classic box will contain 16 factions (178 unique miniatures) and 2 Battle Sets (enough to set up 2 simultaneous games, or one 4 player game). This will be enhanced with all the stretch goals and bonuses unlocked during the campaign: miniatures, terrain, and other game material. Some stretch goals will be available separately, as add-ons. All of the stretch goals will unlock miniatures which will automatically be added to the contents of the box. A Battle Set contains all you need to prepare your battlefield: a game map and a set of terrain. The terrain pieces will be designed by Thierry Husser, once a member of the Rackham Studio; I’ve reviewed his wonderful terrain pieces here. Also, the Battle Set will be available as an add-on, so you’ll be able to play from 2 to 4 players, all the way to 16 players with the same basic box, simply by getting extra Battle Sets (very useful if you’re a gaming club or a convention and want to hold tournaments). 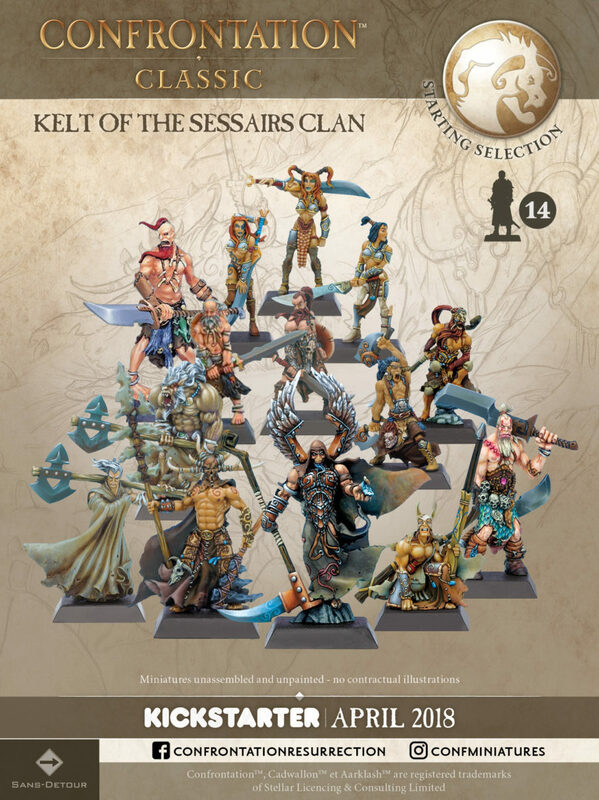 UH: 178 miniatures in 16 factions in a single box, Thierry Husser’s wonderful terrain, maps, stretch goals – it’s an impressive and ambitious campaign. How did you choose what to put in and what to leave out? For sure it’s an impressive box! But so is the Confrontation range! Imagine: more than 1300 minis were produced by Rackham. Here, we are just offering a small part of this legacy (and still we are frustrated because we feel it’s not enough!) In fact it is the only way for us to offer all the factions developed by Rackham. If we had to stick to the best sellers, half of those factions wouldn’t be available… as we want to celebrate the whole universe it makes sense to bring back all factions. 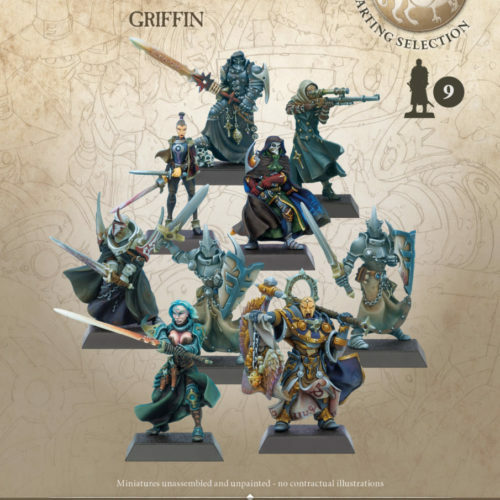 Sans Détour have put a lot of thought into this selection, choosing the most attractive miniatures that are also the most representative of their particular faction. Also taken into account was the style of gameplay unique to each faction and the variety in which they all work together in interesting, yet balanced, ways. Votes on their Facebook page helped them make the the final decisions. 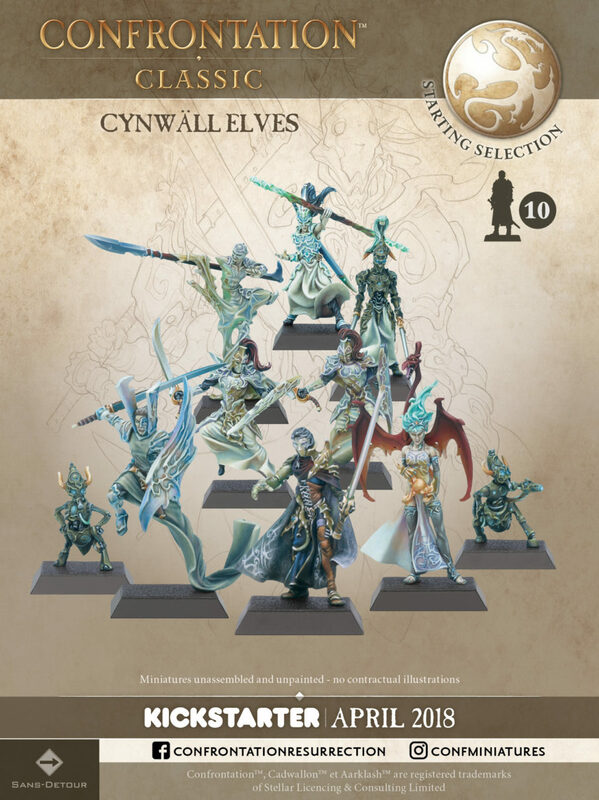 By the way, every miniature will be playable with the rules for Confrontation Resurrection, coming in 2019. UH: What kind of plastics are you using? Will there be any danger of bendy spears and the like? We know it’s a matter of concern for the community. And it’s something we really care a lot about. We are gamers as well as publishers, and when it comes to the quality of our products, Confrontation deserves only the best. We are working hard on this particular subject, with some of the best and known manufacturers to offer the best quality possible. 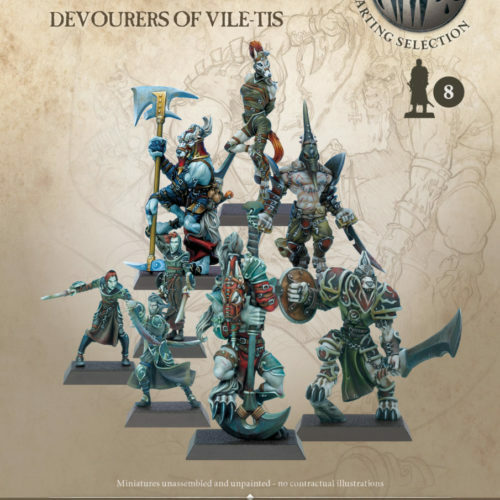 The miniatures will come unpainted (as did the original metal Confrontation miniatures), and the box will come with both round and square bases so you can base your figures in the way you prefer. UH: I notice the graphic design style of the original game is unchanged. Is this just for Classic, or will this style continue for Resurrection? Well, our graphic designer will be glad to know that you think the design is still the same! He worked hard to make sure the original design of Confrontation was preserved. The design for Resurrection is going to be a bit different though. UH: Talking about graphic design (I’m a graphic designer), there were some readability issues with 3.5 – very tiny type reversed out of dark backgrounds, and difficult-to-read icons. Have these issues been addressed? We have that in mind indeed. We know that icons were sometimes a bit difficult to understand… In fact Confrontation: Age of Rag’narok was better designed. We will make sure that Confrontation Resurrection offers a nice compromise between graphic identity and “gaming comfort”. UH: Another issue with the old Rackham was some poor translation work. Are you doing anything to ensure the rules are well translated to English (and presumably, to other languages)? We have now a professional translation team (luckily, not me!) with a native English proofreader and we will make sure to provide the best material. We will also most probably offer an open access to Resurrection before releasing it so that the community can contribute to the final rules. And make sure there aren’t any misunderstandings. UH: Are there any other plans for other Rackham properties such as Cadwallon and Hybrid? Or other new games? We have many plans for this unique and wide universe. An RPG is a sure thing – Sans Détour is an RPG publisher after all. Boardgames too… for now, Confrontation Classic is a start and Resurrection will be the next step. Confrontation Classic is really about celebration. It’s the 20th anniversary of Confrontation this year and we really want to show off the game and the universe. 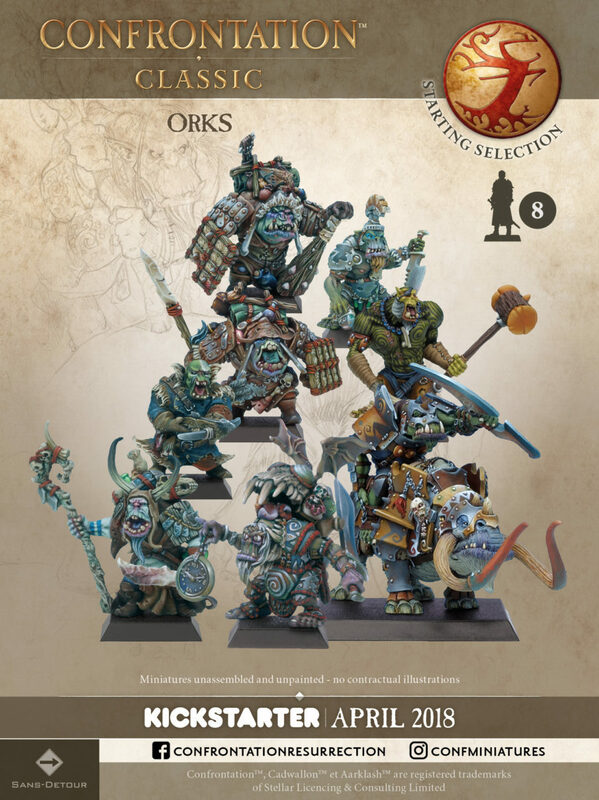 UH: Finally, what is it that you think is special about these miniatures and these rules? Old players will probably get on board right away, but what is it about the game that you think will attract new players and collectors? I can’t really be impartial as I am a big fan of the game and its universe. For me the first thing is the depth of the universe. So many things were developed, giving life to an amazing medieval fantastic world. In the end, I never really found anything like that in other games I played. UH: Good luck with the campaign Josselin, and thanks for talking to the EOG! For more information of the Confrontation relaunch, check out the Confrontation Resurrection Facebook page, or visit the website and signup to the Aarklash Post newsletter. Sans Détour are celebrating the lead up to the Kickstarter launch with a special promotion. 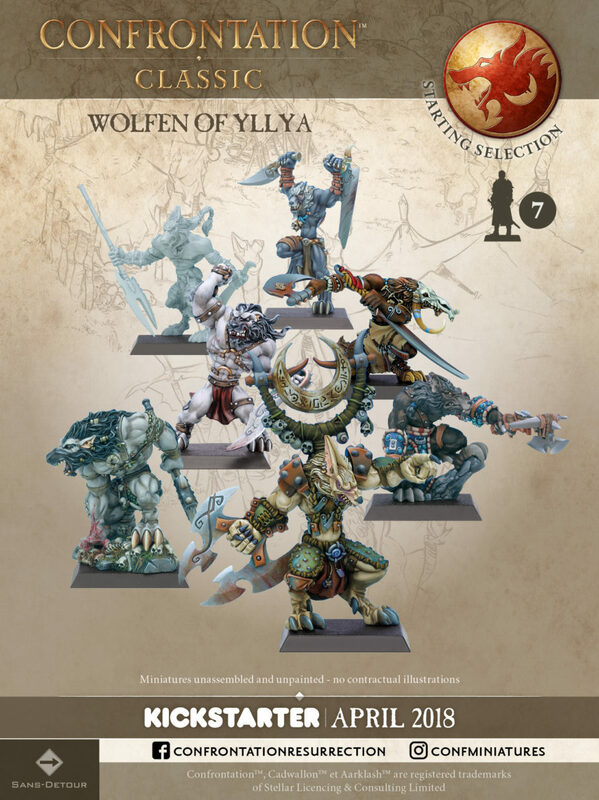 If you reserve your Confrontation Classic event box now, you also reserve 3 exclusive bonus resin miniatures, with an estimated value of more than 30 euros. 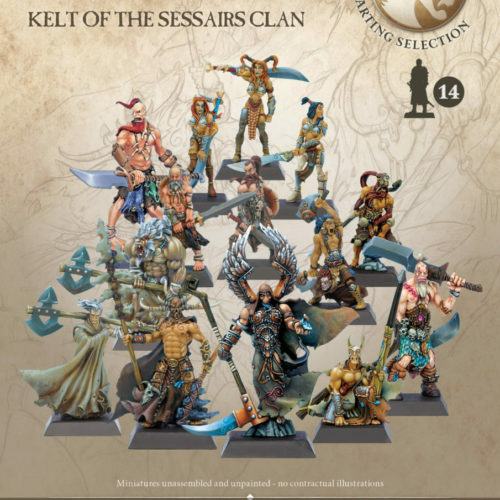 Just send an email to confrontation3miniatures@sans-detour.com before Sunday, April 15th at 11:59 PM (GMT-11), specifying your family name and given name in your mail. This reservation is not a pledge subscription or an Early Bird, and it isn’t open to stores. It will automatically be validated only when you pledge for the Confrontation Classic box during the Kickstarter campaign in April 2018, and it will be cancelled if you do not pledge. The email address with which you make this reservation must be the same as the one with which you pledge during the Kickstarter. In case of doubt, send a second reservation email with the right email address. Only one reservation per email and Confrontation box pledge. These 3 miniatures are bonus exclusives, designed by Rackham, but never released. They will not be available after the start of the Kickstarter campaign, or via stores! They are are 2 Unstable Gargoyles, bound to the Limbo of Acheron, and Ashan Delerith, a stateless character, playable by all factions. 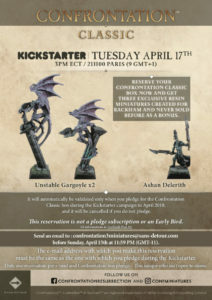 The 3 miniatures will be shipped to you as a bonus with your Confrontation Classic box. The reservation offer ends on Sunday, April 15th at 11:59 PM (GMT-11). After that date, reservations will still be open, but you will no longer benefit from this bonus. Register on the Confrontation website as a Bounty Hunter, and by promoting the campaign on social networks you can earn ESD (‘Editions Sans-Détour’), a special currency you can later exchange for items during the Kickstarter campaign. Original art is also up for grabs! Check out Issue #6 of the Aarklash Post for full details. The Confrontation Classic Kickstarter campaign is the prelude to the great return of Confrontation and many other projects set in the same universe. The first of these will be Confrontation Resurrection, the setting of which takes place after Rag’Narok. Writing has already begun on this new version of the game. It will also be a skirmish-level game. 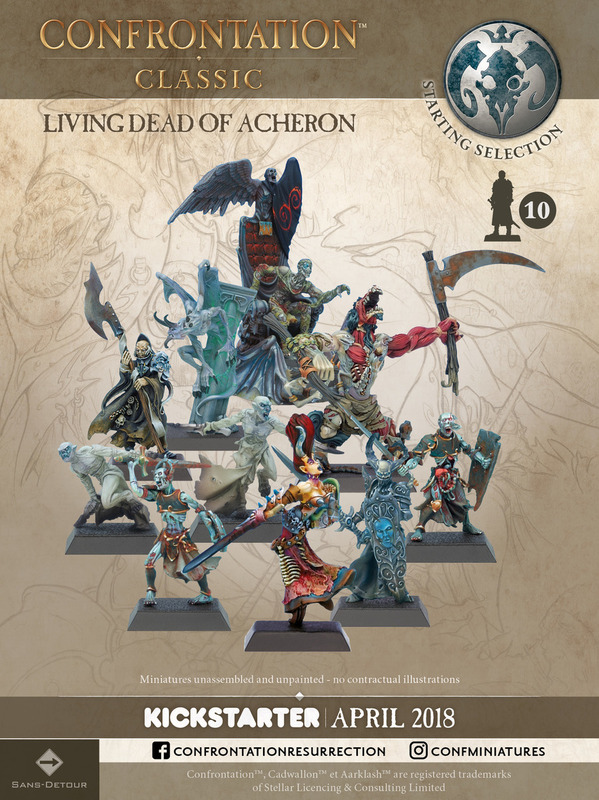 No faction will disappear – you’ll be able to use your favorite armies, though they’re not going to reveal how any of them have survived the cataclysm just yet… All of the miniatures from the Confrontation Classic Kickstarter will be compatible with Resurrection and will have their profiles ported to this new edition. All of the rules will be re-written, in order to match modern gaming styles. You’ll be able to play with all of your factions using both the historical rules and the new rules they’re currently writing. According to Sans Détour, this is really a project aimed at the future and the basis from which they will be developing other projects: expansions, boardgames, roleplaying games, and more. 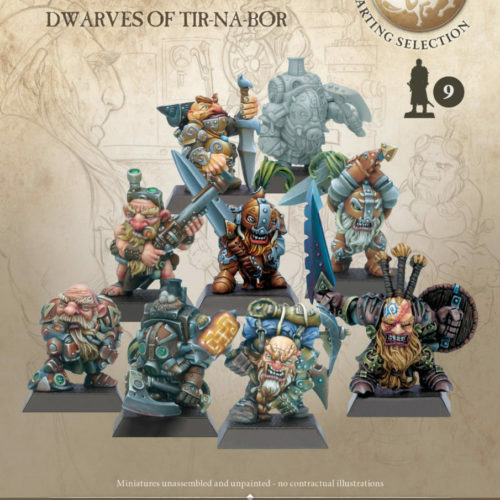 The great thing is, your miniatures will be usuable in all these games! The Kickstarter campaign is now live here. If you enjoy this article, please consider becoming a regular supporter of the EOG. Your generosity means I can keep making great gaming stuff that improves your tabletop game experiences. Thank you! 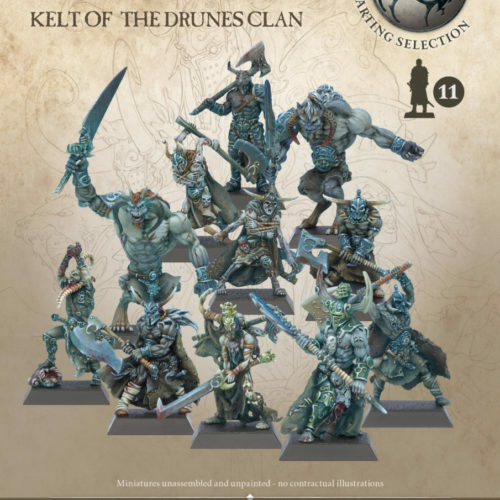 Any hint how much the KS will cost? 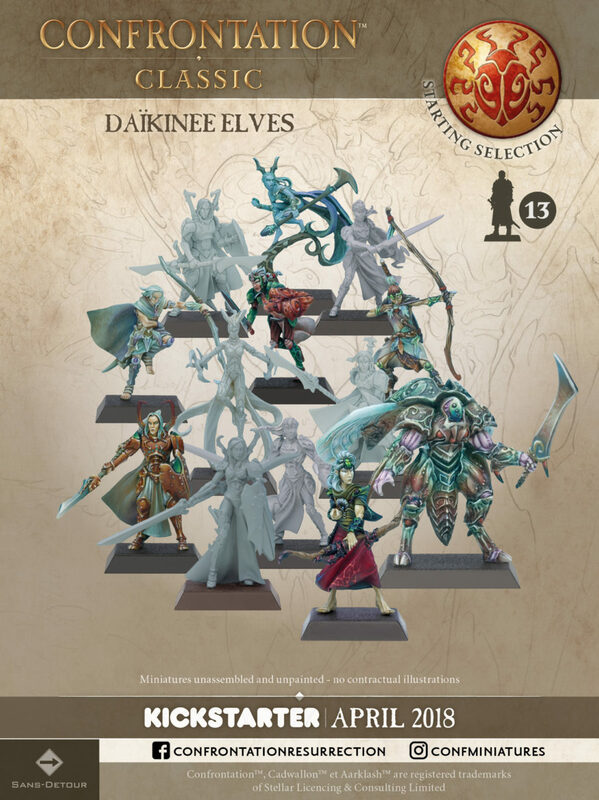 That many miniatures suggests a very expensive box and may be beyond my willingness to spend. You’ll have to wait until the launch on April 17 to evaluate the value. 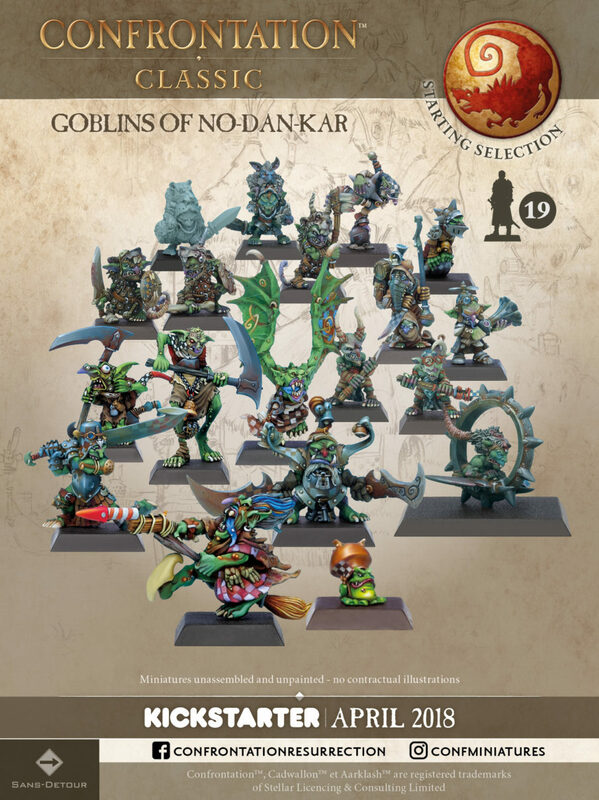 But remember they’re all unique sculpts! This is super exciting. I’ve been running an ongoing Cadwallon RPG campaign for two years now and to see that more is coming for that as well as Confrontation is just… well, it makes my day. Plus, I’ll cross my fingers that they don’t stop at Confrontation… AT-43 maybe?! 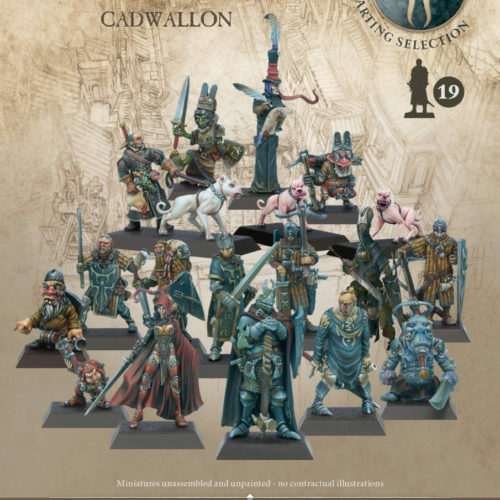 Very interesting – tell us more about your Cadwallon campaign. Is it just using the rules from the hardcover book? I have it, but have never actually sat down and read the whole thing. What are the rules like? What’s your campaign like? As for AT-43, I’ve been told it’s not likely to return in it’s ‘current’ form. But a similar scifi universe by Sans Détour … who knows? It should also be said that the power level of the game is just over the top. Spells are just stupid sometimes. Be very afraid if a Tarot Mage appears, and even more so if that Tarot Mage is part of the party. Early in the game I had such a player. I even created physical Tarot card props for the player to keep track of their mana in each card and to throw down onto the table so we all knew what he was about to do. So, when the player tore one of his cards in half, we all knew bad things were about to happen. The resulting explosion leveled the entire area in the game and obliterated three players. That said, some of the most fun from playing Cadwallon comes from just how over the top everything is. Party traveling into the Upper City? They better not be carrying their own weapons! There’s a guild of weapon bearers who must be hired to carry them or the guard can arrest you, Free Leaguer or not. I’ve made some other handy reference material in Lucidpress (a small book that has all the skills in it, for example). As for the story, the players are members of the Guild of Thieves. They need to pay a cut to the Duke every month to retain their status as a Free League. They went from simple street thugs to investigation a rogue faction of Dirz who were trying to destroy part of the city using a series of “magic repeaters” hidden inside food carts. The players battled Dirz many times and in the end saved the city, only to get a bill from the Duke; they came up short. So then I did a one shot using the game board from City of Thieves and had the players dodging the city guard whilst breaking into houses to acquire the tribute they needed to stay in business. Two years running and my players still love the game. Sigh… well even if we don’t get any more AT-43, at least we get Confrontation. I still play AT-43 from time to time and I’d love to see it come back, even if it wasn’t pre-painted. Remarkable! You’re the first person I’ve heard of who ever played the game. Thanks for sharing, that was fascinating. You may find you’ll be able to smoothly seque your campaign into a Sans Détour RPG; they seem particularly keen to make one set in Aarklash. 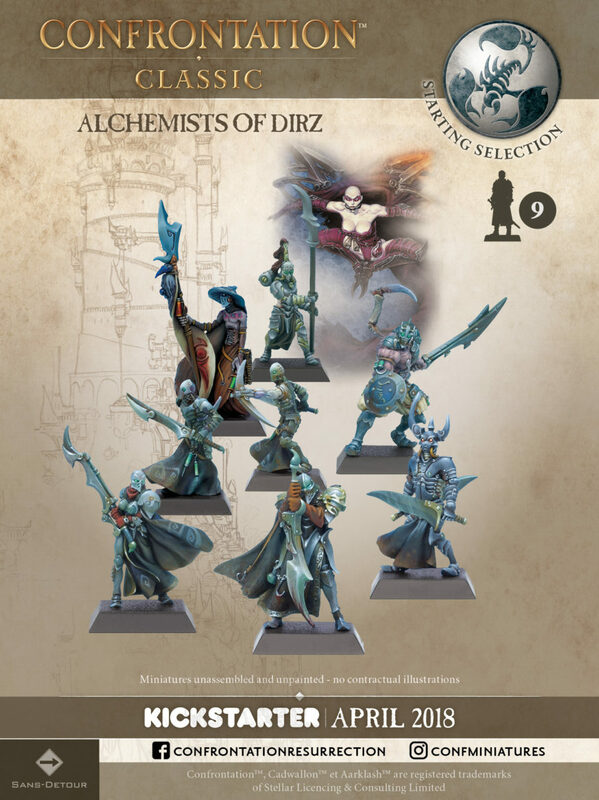 What I am not sure about…are those models in the factions a good “starter” force to play the 3.5 rules? Or just a random “those where great in the faction” assembly? 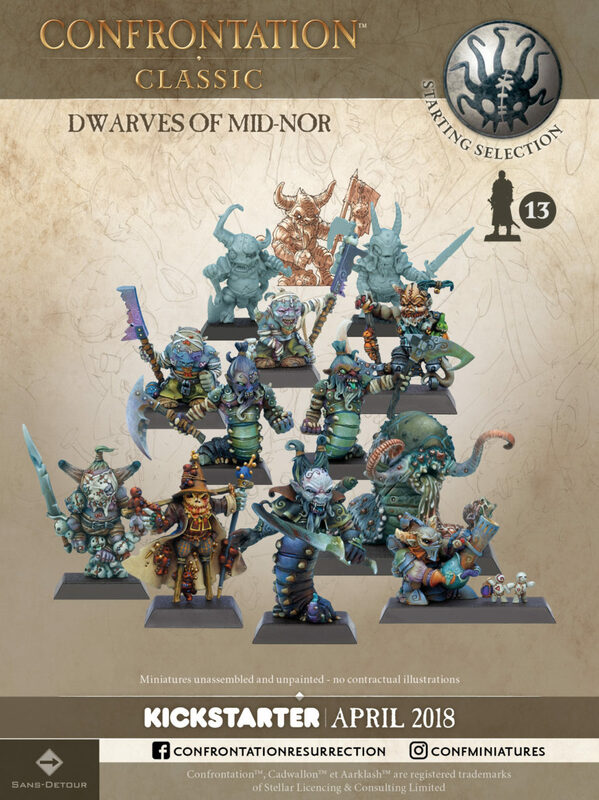 Why such a huge amount of minis and no single faction option? 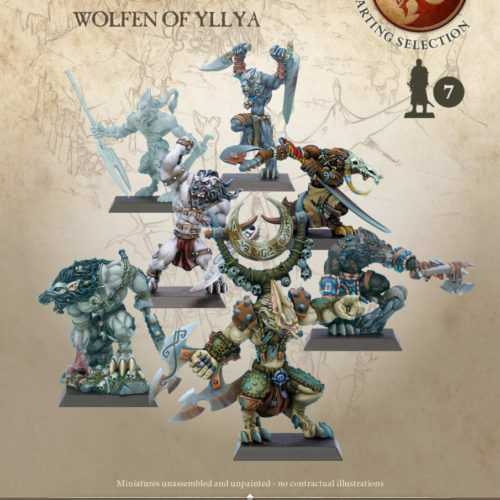 Why should a newcomer buy that many models from that many factions at once? See above the paragraph about them being balanced, offering a good range that’s indicative of the style of gameplay of each faction etc. I’m not sure about your second question though, I’ll see if I can get an answer. In the video for the KS, it claims to be the ‘greatest skirmish game ever’… a bold claim…. What makes Confrontation special? Does it live up to that claim? I find it always best to take marketing speak with a grain of salt. 🙂 Confrontation 3.5 was pretty popular in Europe, but as I explain, I’ve never played it. I have the book though. But the special thing about the game has always been the miniatures. Approximately £260 for the pledge. That’s me out. A couple of starters I might take, but 16 starters is ridiculous. There’s no denying it’s pricey! 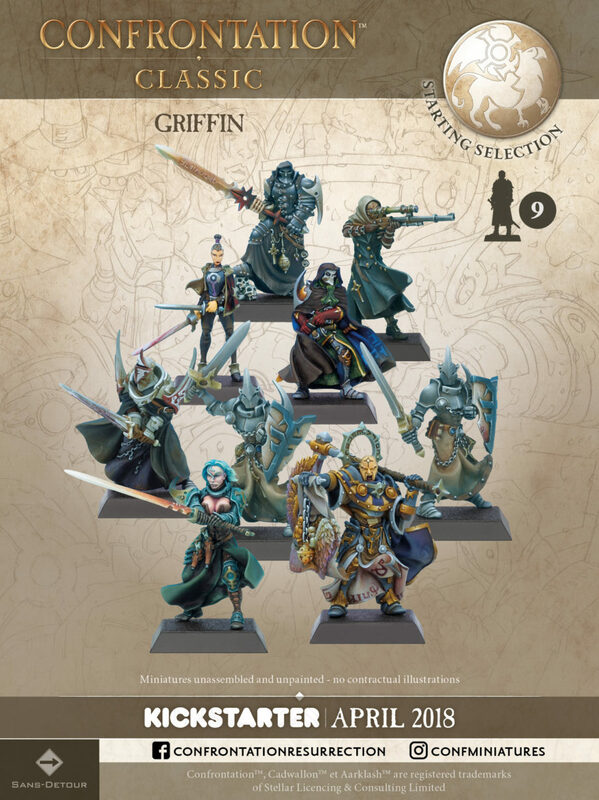 I’d prefer to see the Battle Sets as optional as there’s nothing in them that I need, and I’m keen to see some actual samples of the new plastic figures. The ‘all or nothing’ nature of the campaign seems to be an controversial choice with many potential backers. Although it’s 200% funded, lot of questions. Backers want to see some plastic miniatures. And requests for small pledge than the 300 euro entry. As this project stands… I personally would not trust them to deliver a product worth the asking price. Creators need to answer backers questions or they may start losing backers. Once that happens and stretch goals start fading, more drop out and the end is nigh. Well… they listened to backers… sort of… agreed to sell factions separately… but only if the campaign hits 1.25 million euros. that’s double what it’s at now 617K and it’s been there for about a week. No intention of backing at moment… I just pop by out of curiosity. This KS has been steadily losing $ and backers the last several days. 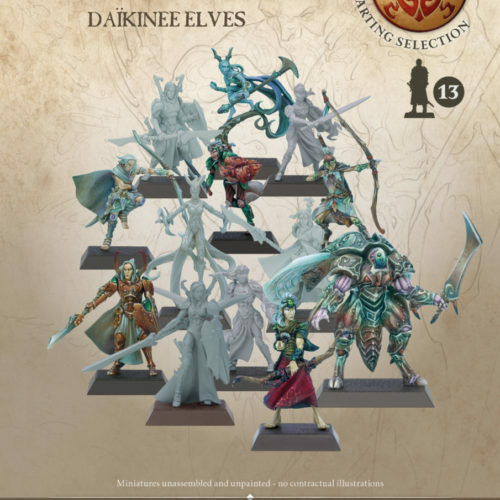 IMO, the buy in price is way, way too much for unassembled, unpainted miniatures…..I don’t care how nice they are. 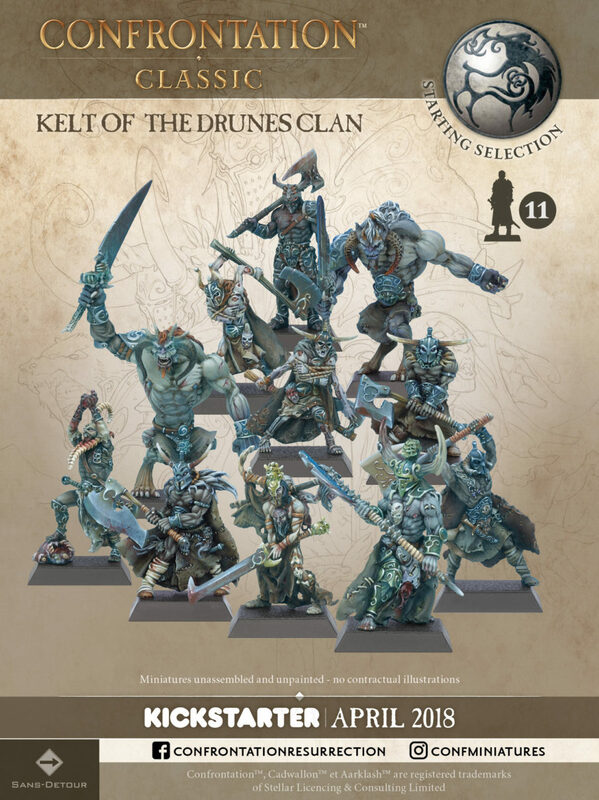 I never had any intention of backing the way this KS was structured – but if it is feasible, down the line i may attempt to play the skirmish game with the 3 factions of my prepainted Confrontation Ragnarok miniatures (of which i have alot of). I should be absolutely clear and mention that I’ve been promised a free pledge from Sans Détour, even though my opinions are my own. The communication has not been as good as it could be I agree, though from my emails with Josselin I do get the impression they are sincere fans and want to see the best for Confrontation. 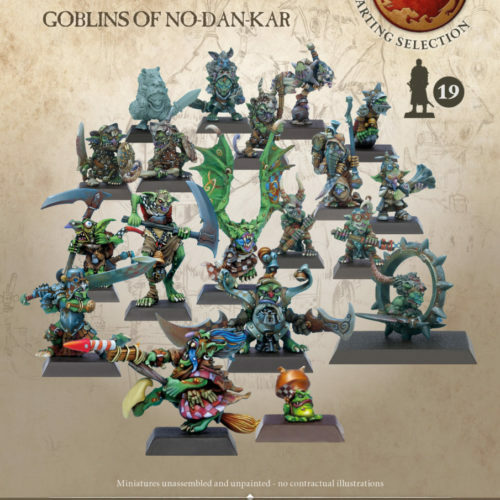 They have now made it clear in the comments this is a Kickstarter to raise the funds to give people the opportunity to get hold of a big selection of the old figures. They have the old sculpts, but they don’t have the resources to show plastic samples, as this is raising the capital to do all that. I think in their enthusiasm they didn’t make that clear, and a lot of people expected that the production was already underway, in the manner of a CMON or Monolith project. I think cultural differences have made clear communication difficult too. In other words, this is more of an ‘old school’ Kickstarter campaign than the ‘shop style’ ones gamers have been used to backing lately, and requires a certain level of trust which backers need to invest along with their money. The price is very good per mini, but I agree more flexibility and choice in what you could buy would have been preferable. In an attempt to get everything done in one go, the decision to go ‘all or nothing’ has probably put off a lot of potential backers. I think that, as fans, their main focus is to get Confrontation alive and kicking again. 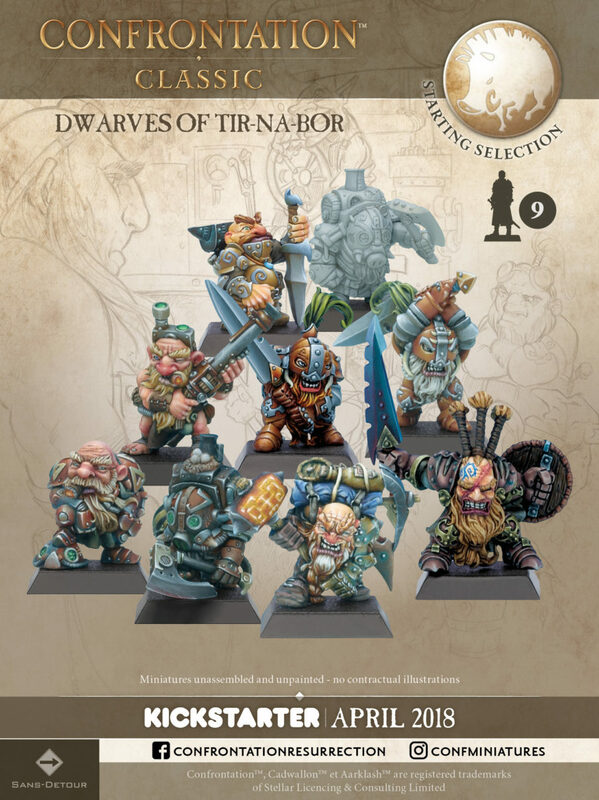 BTW there’s an opportunity to get some large resin figures as add-ons. I’ve dropped in a few times out curiosity and comment section largely in french, so I guess it has support, but not from me. 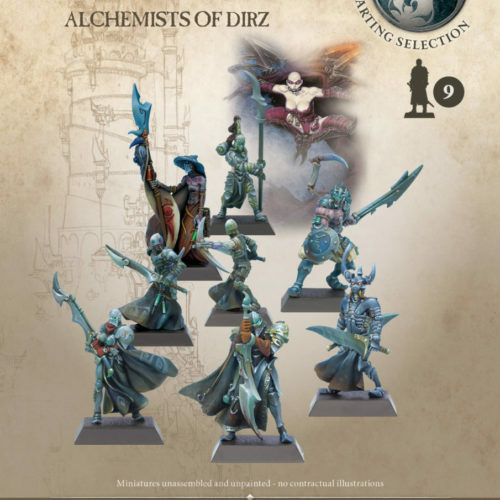 Too rich for my wallet, doesn’t look different enough from other fantasy skirmish games and without samples of miniatures I’m not convinced, as I have a lot of bendy, or low detail figures from first timers. 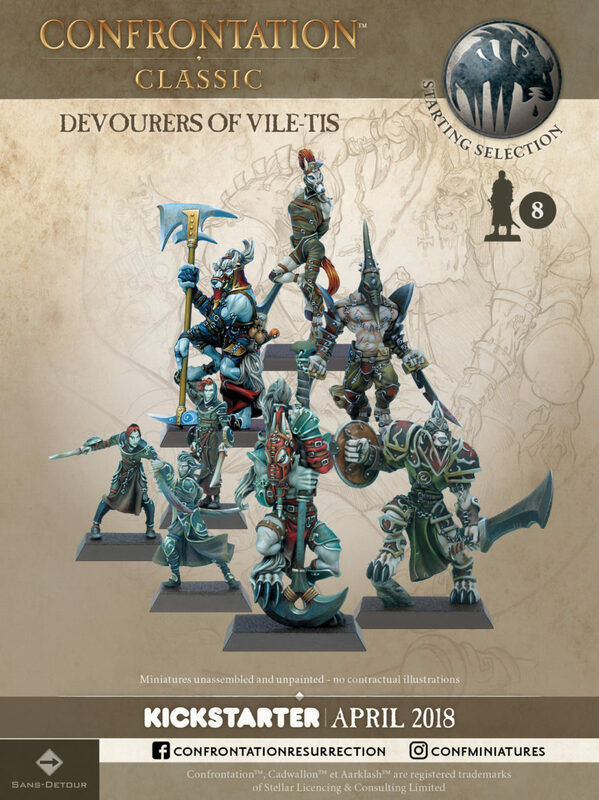 To get my money the game needs something to entice me and sculpts not enough. Hellboy looks fun. Carnevale has interesting setting. Sine Tempora interesting blend of myth and sf. I’ll be interested to see what you have to say about confrontation when you get it. They decided to make it a one time only deal and unlocked all stretch goals. 2000 early birds and 2000 normal pledges. No pledge manager. Not going to retail. It’s still funded, but lost over 50K euros since the first day and still dwindling, so I think this is their last attempt to garner interest. 14 days to go, but still too expensive for me, no matter how limited it is. It just goes to show you that most of the time a kickstarters stretch goals are technically bs. They are basically already “baked in” to the price structure most of the time. This KS has pretty much been in a downward spiral for a couple of weeks now. I am just wondering if it will actually stay above the funding target number when it officially ends about a week from now. Most folks (including myself) only wanted a few factions. Their error was in forcing us to accept all or nothing. While I admit the price per faction is amazing value, the total overall cost of the KS is way too much. If I wanted all the factions it’d be a different story. But I don’t. It funded, which surprised me, as it was losing money virtually every day after day two. Loads of 1 euro backers and I wonder how many of them only want add-ons? I was worried they were going to go under the funding level too. Well, it’s all happening now, so SD are going to be very busy over the next 18 months! Universal Head, curious what you think of the campaign thus far? Have you had any further discussions with Joss? I fear this will not come to fruition! To be really honest with you, I’m not qualified to give an opinion—mainly because I don’t follow Kickstarter campaigns after I’ve backed them (I’m never interested in all the minutiae of the inevitably long process), but also I did get my pledge in return for some promotion, so I’m not as personally invested (though I love Confrontation and probably would have backed it regardless—well, some of it, as I already have bags of miniatures, even old metal ones). Oh, actually, I did pay for shipping. 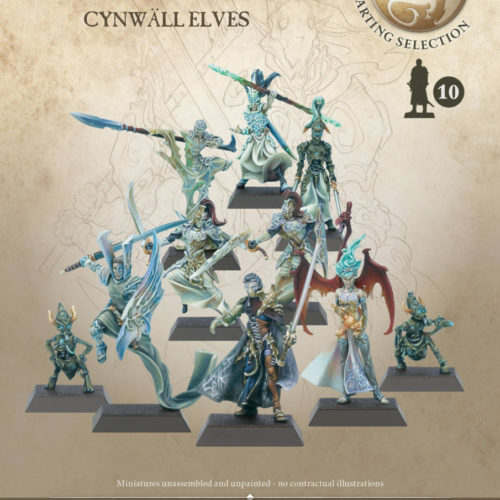 I really hope the campaign goes smoothly, though I do personally think they should communicate more often with their backers—I see the last update was Jan20 and there hasn’t been much detail about production of the plastic minis yet. I can’t comment on any of the other rumours, as I have no inside information. I’ll drop Joss a line and see if he responds, if so, I’ll let you know here.